When tongue pain strikes you, the sensation is usually quite severe. It commonly affects women throughout their life and can range from acute to chronic. Short-lasting tongue pain typically results from a minor mechanical injury to the tongue, such as a bad bite or a hot beverage burn, while persistent tongue pain might be caused by more complex medical conditions. Regardless of its cause, tongue pain can be relieved relatively quickly. 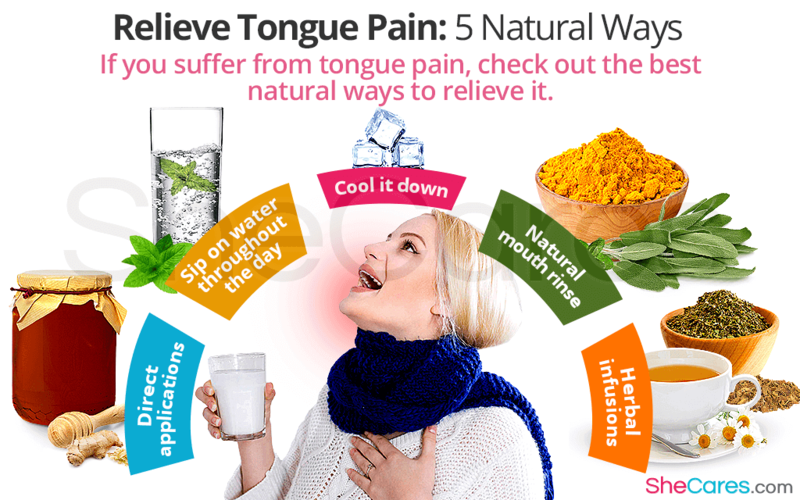 This article takes a closer look at the natural ways in which you can relieve tongue pain with ease. Tongue pain, especially if experienced along with a burning sensation, can be effectively alleviated by sucking on an ice cube. Doing so will also reduce a possible swelling. Keeping your mouth hydrated will help prevent your tongue and mouth from becoming dry, which is known to worsen the pain. You can add a handful of mint leaves for extra nutrients and to take advantage of mint's germicidal and cooling properties. Applying a thin layer of freshly squeezed aloe vera, which has been used for burns and wounds for centuries, can bring a quick relief from tongue pain. Another great method is applying clove in its whole, ground, or essential oil form on the tongue, which will numb its surface and relieve the pain. Putting a little honey or a slice of fresh ginger on the tongue, which is a good antiseptic and pain-reliever, might be helpful if scrapes or cuts are present on the tongue. Turmeric has anti-inflammatory and pain-relieving properties, so mix it with water and gargle with it to relieve tongue pain, prevent inflammation, and help to cure painful mouth ulcers. Also, you can soak some mint, sage, or rosemary in water and use it as a mouthwash a few times a day to relieve tongue pain. All of these herbs exhibit analgesic (pain-relieving) and anti-inflammatory properties. Gargling with a mixture of water and a type of licorice root, called deglycyrrhizinated licorice (DGL), can soothe tongue pain, especially in women with canker sores. It can cause various side effects, so ask your doctor if licorice is right for you. Many women swear by oregano tea for relieving menstrual cramps and other aches, such as tongue pain. Let a teaspoon of oregano steep in a glass of boiling water for ten minutes and then sip it slowly for a quick pain relief. Chamomile tea is also effective in reducing tongue pain, as well as swollen gums and tooth aches. White willow bark tea, which is a well-known anesthetic herb, can reduce the pain in the mouth and prevent inflammation. The above-mentioned methods can successfully relieve tongue pain, but they do not treat its underlying cause. Therefore, you should always let your doctor know about any new and troublesome symptoms you experience to make sure they do signal a more complex condition.